Being best nursing college of chhattisgarh it is our privilege to provide best facility to students and transport is not to be left behind. We have added this for time saving and site visit and frequent travels between diverse locations. The Shri Chandra Nursing College(Inst. ), Durg, Chhattisgarh provides bus facility to students for clinical practice & field visit. 1. Eating in the buses or littering is not permitted. 2. Strict discipline to be maintained in the buses while travelling. Behaviour in the bus should be courteous. Talking aloud and moving up and down is not permitted. More than one complaint of indiscipline in the bus will result in withholding / withdrawing thetransport facility. 3.No monetary transaction to be done through school bus drivers / conductors or any school employees. Shri Chandra Nursing College want is to make learning an stress free infotainment experience. 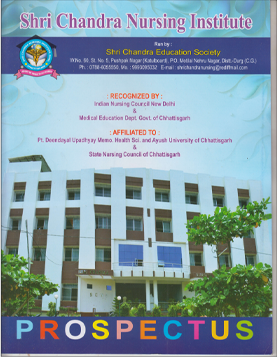 Shri Chandra Nursing College has come a long way to establish itself as the best nursing college of Chhattisgarh.